We find ourselves somewhere in Colombia in the 1950s. That already sets the tone and the mood of the book. I felt I was watching a movie and everything had a sun-kissed look to it. Everything is slower, more relaxed. But we do have to meet Santiago, as he gets killed. He is named the culprit for Angela being returned to her parents by her groom, Bayardo - he's found out she's not a virgin. Poverty also plays a role in how the story evolves - Angela cannot afford not to marry Bayardo. Bayardo has been looking for quite some time to "buy" a wife. Still, at the moment of the wedding, the most extravagant celebration has to be witnessed by the whole village. When the bishop passes with the ship, all the villagers have to offer whatever they have in the hope to get a blessing from him... Such scenes did ring a bell with me because of similar experience I had in small islands - the less one has, the more they have to come up with on grand occasions. The story of the murder of Santiago. Everything narrated is almost hazy - a continuous shift between the time before and after the crime ensures a very entertaining reading, but also gives the impression that no one really knows the true story. Which is, I would think, what the reality of most murders would tend to be like. There are so many parameters, so many actors in such situations, that we will really need to dig to get to the bottom of the story. The narrator in this book does not do so. He lists the various interviews, facts heard or read about in a confused order, so that we come to realise that perhaps this was a murder that was not meant to be. The brothers made everything possible to warn everyone of their intentions half-expecting, I suppose, that at least one would have to decency to lock them up. No one does, however. Their intended act coincides with the arrival of the bishop and people want to take this opportunity to get his blessing (hint: he does not get off the ship...). And so, we're left with a murdered young man who, by all indications, was not involved with the scandal, with a young woman who was in reality glad she did not go through with the masquerade - although in a twist, she falls in love with her husband after he deserts her - and with the two families picking up the pieces and trying to go on living. Just like in real - surreal rather - situations in life. 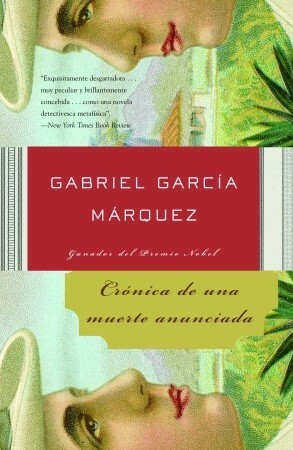 This is a great book and also a great introduction to García Márquez. The first sentence of the book is embedded forever in my brain, for some reason. Yes, I think I'll like his books!